Your Guide to Ring Sizing! There are many reasons why someone might be interested in getting their ring sized. They may have recently gained or lost some weight. Perhaps a woman has just had a baby or someone has been struggling with arthritis, both causing their knuckles to grow in size and making it difficult to slide a ring on and off. Say one’s significant other did not want to give away a surprise and guessed the wrong finger size. Or you simply just want to wear the ring on a different finger. What do you do? Consult a jeweler! It is always a good idea to consult a professional jeweler about finger size. Do not attempt to measure ring size yourself. We also recommend that you get measured multiple times because hand size tends to fluctuate due to many factors, such as diet, how much sleep you got the night before, etc. Ensuring proper fit is also crucial to determining your ring size. The ring should go on rather easily; however, it should be slightly more difficult to get it off. Obviously, if it slides off too easily, there is a greater chance that it will get lost. You should also keep in mind that if you are not accustomed to wearing rings, they will probably feel a little awkward the first couple of days, so be patient, and you will get used to it. As far as the actual sizing process goes, making a ring smaller is much easier than making it larger. Therefore, you should err on the side of caution when choosing a ring size. Once we have determined that the size should be smaller, we will cut a small piece of the metal from the band and solder the two sides together. The band will then be cleaned and polished, and you should not be able to tell that the ring has been resized. However, rings that have ornate designs, such as patterns or filigree, are difficult to resize without losing the detail of the design. If it is possible, the design would have to be remade or restored, adding to the cost. Additionally, if there are stones on the sides of the band, they may need to be reset, which also makes the job more complicated. If you find that you need to increase the size of your ring, there are two options that we will consider. First, we can simply stretch the band. However, this usually only works for about up to half of a size, and it does depend on the material as well as the design. This process works better with plain wedding bands usually. The other option would be to cut the ring, add metal, and solder it together. Keep in mind that the aforementioned issues with ornate designs and rings with stones remain the same in sizing the ring to make it smaller. It is difficult to give a set cost of ring sizing due to the many factors that may be involved in resizing. For example, the metal (i.e. gold prices) and labor costs (i.e. the difficulty of the job). The starting cost is typically around $35 - 40, but can go upwards to $150 - 200. There are certain materials that are impossible to size. Basically we would not be able to do anything that is made of non-metal, titanium, tungsten, or stainless steel. So keep that in mind when shopping for your wedding bands. Amazonite - This beautiful blue-green square(ish) stone is mined in Amelia County. In addition to being pleasing to the eye, it is said to enhance intuition, psychic powers, creativity, intellect, and psychic ability. Unakite - This mottled pink and green oval stone came from right up the road in Lexington, Rockbridge County. It is typically found in the valleys of rivers after having been washed down from the Blue Ridge mountains. Unakite helps balance emotions and relieve stress. Rhodonite - The middle stone that comes to a point at the top is a type of rhodonite that originated from Fluvanna County. The stone next to it is a Pink Rhodonite, which comes from the same location. They come in pink and red colors and often contain black manganese oxide veins running through them. Rhodonite is believed to relieve anxiety and is also a symbol of grace and elegance. Limonite after Pyrite - This distinct gemstone gets its name from its "birth" process and comes from Schuyler, Nelson County. First, the pyrite starts to decompose due to chemical weathering, and the iron in the rock starts to rust. Once the rust has begun, limonite starts to pseudomorph into, i.e. take the shape of, the pyrite. This square stone has a brownish red color with tiny holes, which gives it a distinctively dramatic look. Pyrite is typically used as a shield to defend against negative energy while limonite helps to support physical strength and virility. We have been fortunate to have a diverse demographic of customers over the years here in small town Blacksburg, VA. Learning about and adhering to other cultures’ customs during the engagement and marriage process is something that we have enjoyed being included in. While wedding and engagements rings are often a universal symbol of love and commitment, there are cultural variations of how they are presented, chosen, and designed. The rings shown in the picture below are ones that we designed for a couple from Sweden. Whereas the tradition in many cultures is to propose with a diamond ring, the custom in Sweden has been for both men and women to wear simple gold bands as their engagement rings. Afterwards, a diamond ring or another band is typically purchased for the woman to receive at the wedding. Although the bands have traditionally been simple and plain, the look is evolving to include more ornate designs that incorporate individual style and flair. engaged and will be married in the summer. We typically don't carry men's rings other than wedding bands in stock. It's difficult because there is such a wide variety of styles that we normally just custom design them. This particular concept was exciting and out of the ordinary, which is always a fun creative process to be a part of. This ring was commissioned by a local artist and retired professor of Virginia Tech. Donning a ring on almost every finger, he really wanted this particular one to stand out but still blend in with his look and personality. He sports heavy vests, hats, a large bushy beard, as well as silver chains with skull and wing medallions hanging from them. You know, just your run of the mill custom design request! Having long artistic fingers, we knew this ring needed to be quite large. He deeply admires Native American silver motifs, which he wanted included into the design. 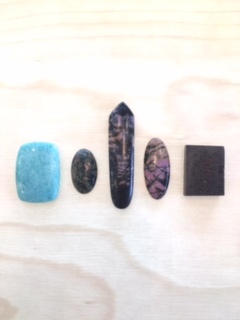 Even though he prefers turquoise, it was decided a dark cabochon onyx would hold up better from daily wear and tear. Because he loves the color red and wanted the ring to have its own personality, a small natural ruby was added to the side serving as a talisman for passion and wealth. A hand-carved wax model was created to adhere to the shape and size of his hand as well as to the proportion of the stones. Having made several original indigenous-inspired designs, Kirk carved the tribal graphics, which were derived from Native American, Aztec, and Caribbean roots, around the shank and bezel. It was then cast in sterling silver, the stones were set, the ring was polished and ready for wear! Do Your Prongs Need Retipping? When was the last time you had your rings checked? We recommend bringing your rings in twice a year to ensure that the prongs are not worn down and are efficiently holding your stones in place. A prong is a metal tine or projection that holds a gemstone in place. A ring can have anywhere from four to hundreds of prongs. How does it get worn down? Prongs become worn from everyday normal use! However, erosion can occur faster due to several situations. For example, if a ring is too large and is constantly being readjusted by your finger (in which case it would also be a good idea to have it sized), or if a stone has been loose for a period of time. Also, wearing your rings while doing manual labor can also cause them to wear more quickly. Do you wear your rings to bed? If so, sheets can actually be abrasive on metal prongs - believe it or not! If we check your rings and find that a prong (or prongs) are worn down, then we will recommend retipping. This process involves soldering a metal bead or wire to the prong with the stone still in place and shaping it so that it functions as a new prong. In some cases, a prong needs to be replaced. If that were the case, then we would saw off the old prong, solder a metal wire and shape it into the new prong - also with the stone still in place. In rare cases, the entire prong setting needs to be replaced where we would remove the stone, assemble a new setting, and then reset the stone. If you do not fix a prong, then you risk your stone coming loose and potentially losing it. It's certainly more economical than replacing a stone! If it's been more than 6 months since you've had your rings checked, bring them in, and we will check them for you free of charge. One of the most interesting and sometimes complicated aspects of custom design in jewelry is finding a way to aesthetically incorporate old stones or metal into new pieces. Jewelry can hold a sentimental or nostalgic value to a person or family, and while a customer may find an inherited piece of jewelry tired or outdated, they don't necessarily want to trade in the piece for a brand new one. There are not many industries where this type of "recycling" (for lack of a better word) is possible. It is rather gratifying to be able to redesign pieces that the customer enjoys wearing and that still maintain the sentimentality. The stones were set, the ring was polished, Justin proposed in the Outer Banks, and Sarah said YES! Congratulations to our best friends! For the past 10 years, we have been commissioned by our longtime customer and friend, Nikki Giovanni, to make an award that is presented to the winner of the Steger Poetry Prize. We hammer and forge sterling silver to create a magnifier statue meant for a desk. The design changes slightly each year. Setting the magnifying glass in a bezel is always a challenge - it is equivalent to setting a giant gemstone. A big congratulations to this year's winner! 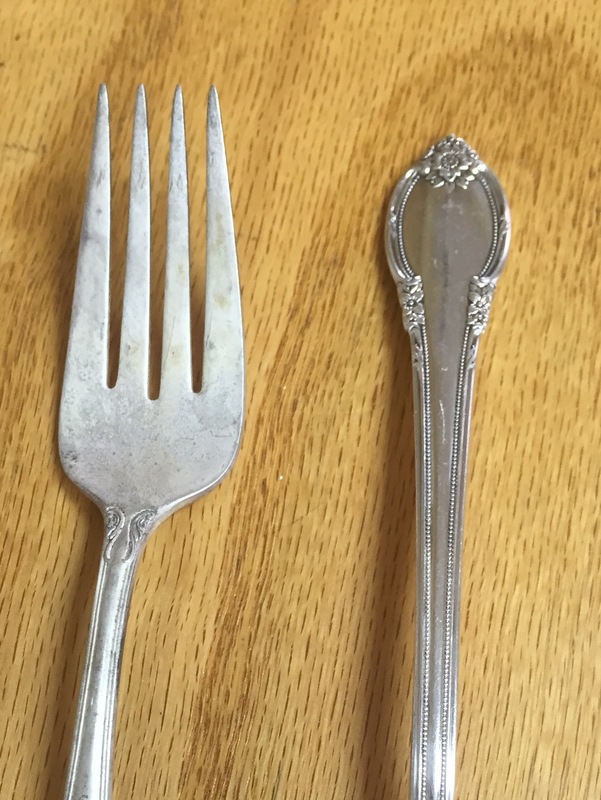 We often have customers coming in and asking us what they can do with antique silverware that they have inherited. Since flatware comes as a set, it is unlikely that you would want to split it up among family members. We recently had a customer who had a set of flatware and pictures she found on the Internet of similar designs. They were her grandmother's, and she wanted a bracelet made for her and her sister. The fork tines were melted and manipulated into heart shapes. While the engraving was already etched on the fork, it can always be added afterwards for a personal touch. Rings can be made out of smaller forks or spoons as well. This is a great way to maintain the sentimentality of a common family heirloom. It's personal yet stylish at the same time! A customer recently came in with an idea for a custom Yellow and Green Emerald necklace for their 55th(!) wedding anniversary, fittingly also known as the Emerald Anniversary. They brought in their own emeralds and their own sketch of the layout they had in mind, which Faith adapted into her own sketch (below). The necklace was to have a minimal amount of yellow gold showing, which is why prongs were used. Additionally, they wanted it to be worn at different lengths, so it was designed so that they could adjust the length to be 16, 18, or 20 inches. A pair of matching earrings were also made. Both the necklace and earrings turned out absolutely stunning!